A massive February 8-9 winter storm brought deep snow and high gusting winds to Northeast and New England states, but so far, “several mitigating factors” have helped to limit the overall damage, according to catastrophe modeling firm AIR Worldwide. “Several mitigating factors have limited damage so far,” said Tim Doggett, principal scientist at AIR Worldwide. He said the Northeast region was not already covered by earlier snow when the storm arrived. Had there been antecedent snow, impacts would have been greater. He also said the snow brought by the storm was of a relatively low density — light and fluffy — in much of the region, thereby minimizing the weight of the snow pack. Also, while some notable wind gusts were observed, the sustained winds were not quite as strong as they were forecast to be — and thus snow drifting and tree damage were lessened. And Doggett said that Monday’s rain notwithstanding, temperatures for the next couple days will be above freezing, so homes that remain without power are less likely to experience frozen pipes, which would be a high possibility at this time of year. However, he said the rain that fell on parts of the Northeast on Monday could increase the weight load on some of the snow-covered roofs, trees and other structures, which might lead to further property damage. AIR Worldwide’s principal scientist Doggett also offered the following observations on how the massive snowstorm was formed and how the storm impacted the Northeast region over the weekend. The storm developed last Thursday and in the early hours of last Friday when a strong coastal disturbance that had developed along the Delmarva Peninsula moved from over the Atlantic and interacted with an upper-level trough that had been bringing widespread snowfall from the Great Lakes across upstate New York, he said. Doggett said that as the two systems approached each other, the energy from the Great Lakes system came into phase with the coastal low pressure system—and the coastal storm rapidly intensified and tracked northeastward, reaching the southern Massachusetts coast last Friday night. At its most intense, the storm produced snowfall at a rate of three to four inches per hour in bands across southern New England. Central Connecticut experienced intense snowfall characterized by imbedded thunderstorms that lasted for several hours last Friday night, additionally increasing the snow totals in that region. The town of Hamden, Connecticut, received 40 inches of snow, the highest so far reported by the National Weather Service. Cold air driven southward in advance of the storm system resulted in lighter, more powdery snow that drifted in the high winds. Overall, the storm deposited between one and three feet of snow in its wake across the whole region. Doggett said that in coastal areas, strong winds knocked out power and caused significant tidal surge. Wind gusts of 83 miles per hour were recorded at Falmouth, Mass.,, while storm surge impacted many coastal communities from Cape Cod north to New Hampshire. The impact of the surge was heightened by the fact that it coincided with the monthly astronomical high tides that occurred late last Friday night and again Saturday morning. He also said that many news reports have referred to the Friday-Saturday storm as a blizzard. But according to the strict meteorological definition of a blizzard, the storm actually may not have met those official criteria. 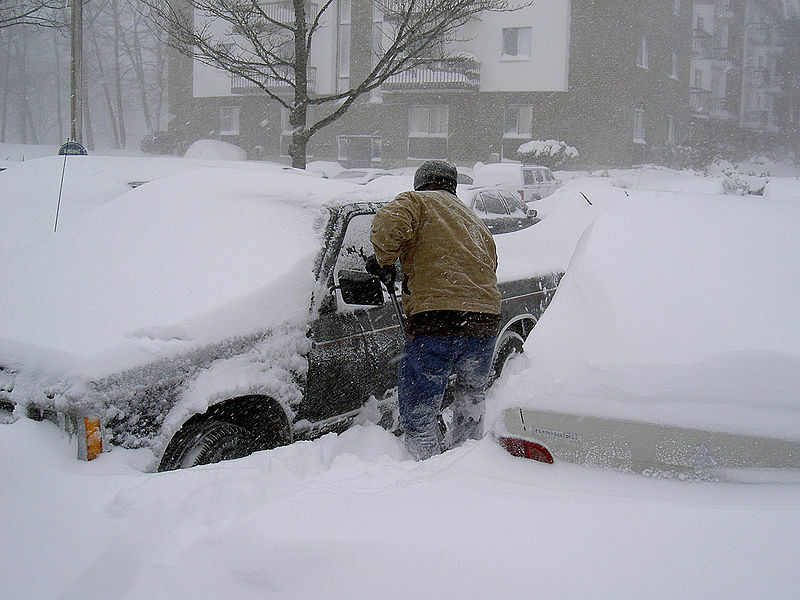 A blizzard, officially, is a severe snowstorm that is characterized by strong sustained winds of at least 35 mph that last for a prolonged period of time—typically three hours or more. Such sustained winds produce a visibility of less than a quarter mile (.25 miles) for their duration. Despite the high wind gusts and significant snowfall, those meteorological criteria of sustained duration (and low visibility) may not have been met. At the height of the storm more than 650,000 customers had lost power throughout the area, mostly in southeastern Massachusetts and on Cape Cod, in Rhode Island, and on the eastern Connecticut shore. In particular, flooding caused extensive damage to the electrical power infrastructure along the southern Massachusetts coast. Connecticut, Massachusetts, New Hampshire, New York, and Rhode Island declared states of emergency —— and President Obama declared a federal state of emergency for Connecticut as well. In Massachusetts, Gov. Duval Patrick declared a ban on all road traffic as of 4:00 pm EST last Friday, except for emergency vehicles and snow plows. The ban, while controversial, is being credited for keeping down the number of fatalities from road accidents, Doggett said.